— Stephen Morely does not own the watch Buzz Aldrin wore on the moon. Such was the finding by NASA that led Morely to drop the federal lawsuit he filed last October against the agency and moonwalker to claim ownership of the watch, reports the San Diego Union Tribune. Morely had hoped the case would force NASA and the Smithsonian to authenticate the Omega Speedmaster chronograph, which he said he purchased from a college student whose father had found it on a beach near Santa Barbara, California. Morely had suspected the watch was flown after learning Aldrin's had gone missing in the 1970s and subsequently discovering the number "43" etched on its case back. The number, Morely believed, may have corresponded to the serial NASA assigned to the Speedmaster Aldrin wore on the moon. "After extensive investigation, including the deposition of a former NASA employee involved in the Apollo program, both Aldrin and the United States concluded the watch was not the watch Aldrin had worn and that they had no interest in the watch," said Assistant U.S. Attorney Robert Plaxico in his filing to a federal judge to dismiss the suit, as quoted by the Tribune. A San Diego judge dismissed the case last Wednesday. Morely's lawyer was still not convinced the watch was not authentic. Attorney Richard Van Dyke told the Tribune he believed the Smithsonian should have the documents to identify the watch, which they didn't or could not provide. "There really is no way for us to know what engravings are supposed to be on this watch," Van Dyke told the Tribune. "The custody of our nation's artifacts have been entrusted to the wrong people." — Stephen Morely, in an interview with The Washington Post, has said he desires to sell the Omega Speedmaster he claims to have been the watch Buzz Aldrin wore on the moon, should the lawsuit he filed for its title be ruled in his favor. Comparing the dispute over the watch with Barry Bonds' 73rd home run baseball, which a judge later ordered to be sold and the profits split, Morely has said he would share the proceeds with Aldrin and the Smithsonian. "I told them I want to create a win/win/win," told Morely to the Post. Aldrin and the government are more interested in return of the watch. "[Aldrin] would love to have it back. In addition, if the Smithsonian wanted it to exhibit, he would lend it to them," said Aldrin's attorney, Robert O'Brien. The article cites an unnamed representative of the federal government stating, "if the watch is the one worn by Buzz Aldrin during his moonwalk, [then it] is the property of the government". — As part of the research into this article, collectSPACE has tried to locate all of the Omega Speedmaster watches worn while in orbit around, or on the surface of, the Moon. "In the course of getting ready to move, I decided to offer a number of things to the Smithsonian. Several objects I took along to the moon and some of the gifts presented on the world tour were included, and the institute quickly accepted. I also included the Omega watch I had worn on the surface of the moon. It was the only such watch, because a timer malfunction in the LM had prompted Neil to leave his watch in the LM. NASA hired special packers who inventoried and shipped the collection to Washington. "The watches used in space were ordinary store-bought Omegas, which were given to the various crews several months before the flight and, by tradition, were kept by the individual astronaut after the flight. The Smithsonian had expressed an interest in exhibiting my watch because it was unique, and I readily agreed. "When the packages arrived at the Smithsonian, the watch -- along with several medals -- was missing. NASA quickly launched a security investigation but could not turn up any clues. The Government Accounting Office got wind of the investigation, and in what I think was a rather narrow-minded decision, ordered that all watches be returned to NASA. When we heard about this we figured NASA would tell the officious GAO people to mind their own business. Instead NASA avoided any confrontation and agreed with the GAO. "The matter probably never would have become an issue had I not decided to let the Smithsonian have my watch, and I felt badly for the other astronauts, nearly all of whom were grumbling audibly. I, meanwhile, started filling out special forms about the loss of my watch -- and kept filling out one form or another for the next year until the matter was dropped." — Buzz Aldrin's watch that he wore on the moon, missing since 1971, may have been found, but its new owner doesn't want to return it. Stephen Morely of Long Beach, Calif. has filed a lawsuit in a federal court to assert he is the rightful owner to the Omega Speedmaster that once was strapped to the wrist of the second man to walk on the lunar surface. Morely claims he bought the watch for $175, responding to an ad placed by a college student in the early 1990s, according to the San Diego Union Tribune. The seller, who Morely no longer remembers by name, said the watch was found by her father in the early 1970s on a beach located near Santa Barbara. After an attempt to sell the watch and a brief encounter with the FBI, Morely decided to file the lawsuit "to bring legitimacy to the watch and its potential owners," he told the Tribune. "I want to see this resolved." Before any resolution can be reached however, the issue still remains if the watch Morely owns is indeed the same Omega that flew to the moon in 1969. 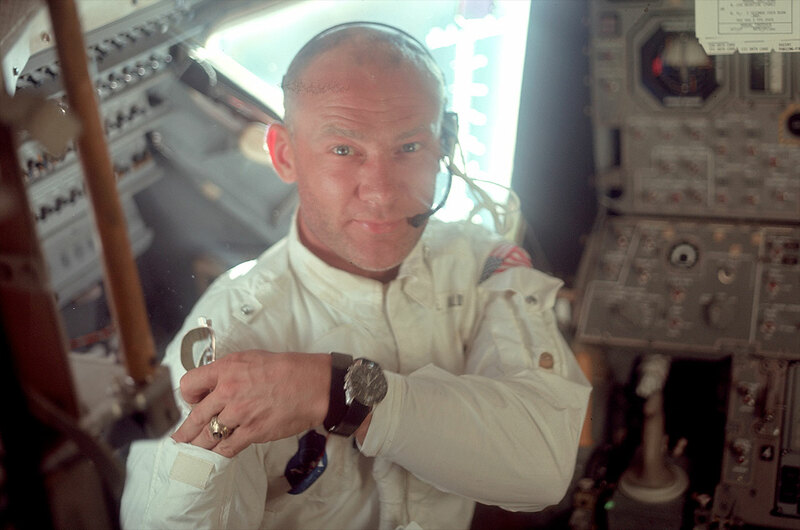 According to the Tribune, Morely located a serial number etched inside the watch that he believes corresponds to the Speedmaster that was assigned to Aldrin. He tried to contact the Smithsonian for assistance, as well as filed a Freedom of Information Act request with NASA, but said he received little assistance from either. The Smithsonian and NASA have reportedly laid claims on the watch, if it is authentic. So has Aldrin, who through his lawyer told the Tribune he hoped Morely would decide to return the watch to him. After returning from the moon, Aldrin intended to donate the watch to the Smithsonian, when it went missing with a shipment of other artifacts. As of result of the (assumed) theft, the Government Accounting Office instructed NASA to recover all of the astronauts' flown Omega watches. "It is true the Smithsonian claims all the flown watches as government property, although most of us have ours 'on permanent loan' from the Smithsonian," wrote Apollo 14 moonwalker Edgar Mitchell in a recent reply posted to his website's forums. "Mine is at the Space Hall of Fame — on loan to them." Morely believes that it wasn't the flown watch that Aldrin sent to the Smithsonian in 1971, but instead some other timepiece NASA had provided him. He believes Aldrin lost the Omega that he wore on Apollo 11 while standing on a California beach watching Apollo 15 fly overhead. 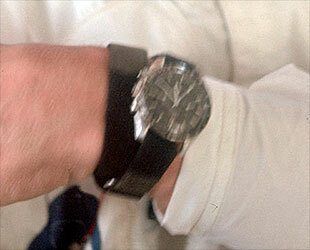 Morely isn't the first person to step forward with claims of owning Aldrin's lost watch. Over the past three decades, there have been numerous reports of the missing Omega, all of which have been dismissed as false leads.